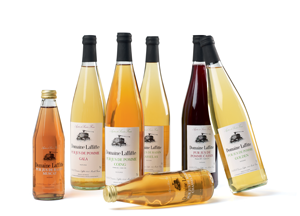 Apples, grapes...the sunny fruit of South West France are simply pressed and bottled. No added sugar or water, they just offer the intense taste of the ripe fruit with their natural sweet flavour. Chanteclerc apple, Reine des Reinettes apple, Muscat grape, apple & raspberry, apple & blackcurrant, sparkling juices...in 75cl and 33cl glass bottles.